Another overseas Test series that began with a lot of hope and promise. Another series loss with a resounding scoreline. But is it the same story all over again? Not really. In fact, the only one-sided loss was the innings defeat at Lord’s. Let us look at the first four Tests of the series, in which the series outcome was decided. Though there were many talking points in the fifth Test, the performances came under different circumstances, when the pressures of fighting for a series were gone. In the first four Tests, the Indian bowling attack was as potent as the English attack. Some would go so far as to say that the Indian bowlers just did not have Lady Luck on their side. The struggles of the Indian top order, barring Kohli of course, mirrored the struggles of the English top order. The big difference was that the English were able to press home the advantage every time they got past the top four or five wickets. At both Birmingham and Southampton, when the Indian quicks had blown away the top order, the English lower order wagged and took the team to relative safety. Was this because the likes of Sam Curran, Jos Buttler, and others were technically better batsmen than the top order? Or was it that the Indians were not proactive enough to tighten the screws when required? The latter seems more likely. As captain of Team India, Virat Kohli has two main responsibilities on the field. First and foremost, he must lead from the front and perform with the bat. He did exactly that in this series, amassing 593 runs across the five Tests. The next Indian batsmen on the list is KL Rahul, with 299 runs. This of course, includes the 149 he scored in the second innings of the fifth Test. Cheteshwar Pujara, with 278 runs, is a close third. Given these numbers, it is safe to say that Kohli is indeed, heads and shoulders above the rest of the Indian batsmen. The second major responsibility of the captain is to marshal his bowlers and his fielders to bowl out the opposing batting line-up. It is here that some question marks emerge regarding his captaincy. Of course, as time goes on, he will learn and become a more astute captain. Now, in any team, if the leader is not on the right path, the senior folk need to step up and advise him/her. At crucial stages of the each of these Tests, did he receive enough advice from the likes of Rahane, his vice-captain and other senior players, like Pujara and Dhawan? There is no question that the larger-than-life persona of Virat Kohli has had a huge impact on the rest of the team. 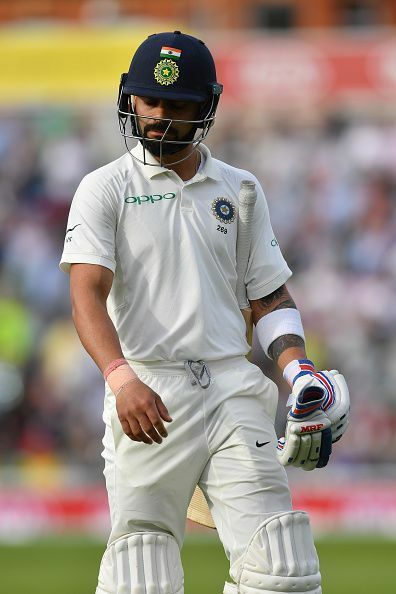 The new-found aggression of the pace attack, the fearless attitude of the newcomers, the overall improvement in physical fitness, the sharpness in the ground fielding are some of the hallmarks of the Kohli era. This persona needs to be considered in the context of the sheer gulf in class between Kohli and the other batsmen. One might begin to wonder whether some unhealthy reverence towards King Kohli has crept into the rest of the team. Is it even possible for any of the others to question Kohli’s captaincy on the field? Let us take the example of Shikhar Dhawan. He knows that while his captain is batting his heart out, he has failed repeatedly. Now, having already incurred Kohli’s disappointment, if not his wrath, he would find it extremely difficult to tell Kohli that his current plans are wrong and that he should try a different strategy. King Kohli’s captaincy is obviously a work in progress, but his sheer dominance in terms of skill and ability over the rest may actually be hampering the feedback system in the team. Had he had better advice, maybe, just maybe, the opportunities at Birmingham and Southampton would not have gone begging and that scoreline may have looked very different. Going forward, can Captain Kohli find a way around King Kohli and encourage others to stand up and advise him on the field?